This third aspect of the Artist’s Wheel often throws students off. What on earth does our body have to do with leadership? Or the act of creating? And we’re not just talking about body language: how we compose our facial expressions, gesture our hands, and stand in front of a room full of people. This discussion of our body is far more comprehensive. 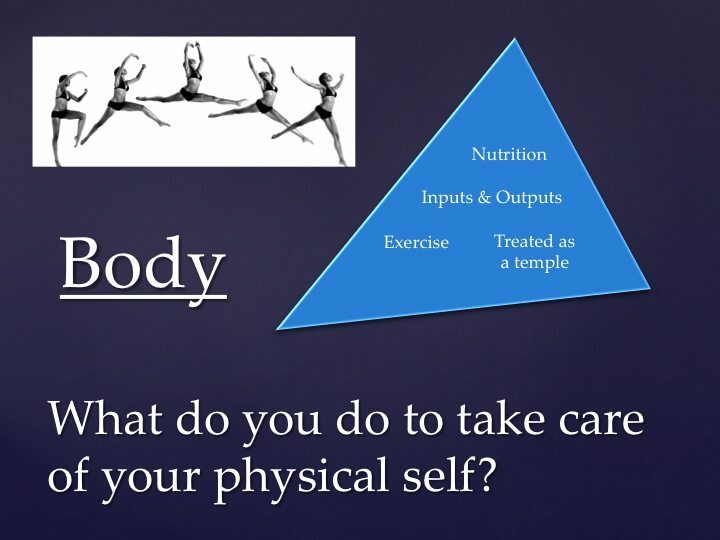 How do you take care of your body? What are you consuming to maintain and increase your energy? What are the long-term effects of those inputs? How do you exercise your heart and make your blood flow? Just as we are what we eat, we are also how we move. As an academic, I have the habit of using my body as only a means to transport my mind (Ken Robinson helped me realize that). This can be dangerous for my physical and emotional well-being and my mental capacity. We can not just stare at computer screens, smart phones, and T.V.s all day and expect the creative sparks to flow. Fortunately, I’ve found running, yoga, skiing, and walking, and created rather disciplined practices of each. What do you do to keep your body in motion everyday? If there’s no answer to this, what might you do? When “sitting is the smoking of our generation,” became a meme, it reenforced our need to move our bodies. While some artists might draw from dark times, I’ve found that my creative energy is strongest when I feel good, alert, exercised, and rested. In fact, after writing for the last couple of hours and working on some strategy projects, I’m exhausted and out of creative energy. It’s time for a healthy meal and some running.